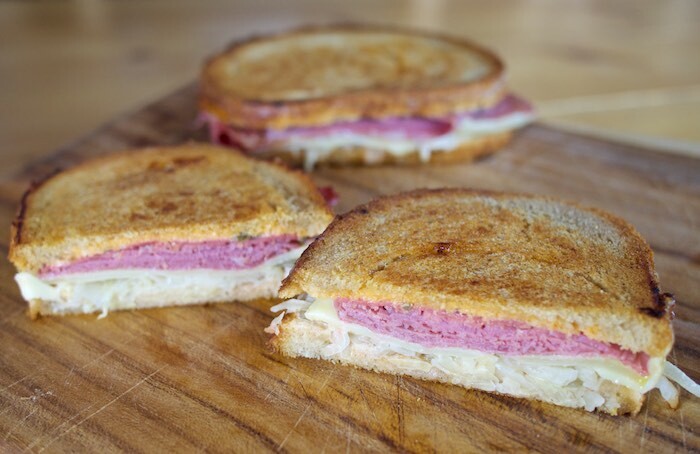 The Reuben sandwich was a favorite of mine growing up and something I would order whenever we went out for lunch. Maybe it was because my mom never made them at home; but most likely it was the fact that the sandwich came piled high with meat, sauerkraut and oozed with Russian Dressing. It's been years since I've had a Reuben, but recently this classic sandwich has been on my mind. So with homemade sauerkraut from the local butcher and fresh rye bread from the German bakery I decided now was as good a time as ever to recreate them at home. Butter one side of two slices of bread, and place the slices buttered-side down. Spread Russian dressing on both pieces. Top each with sauerkraut, Swiss cheese, and corned beef. Top with the remaining bread slices; butter the side facing out. Preheat a griddle or frying pan to medium heat. Cook the sandwiches on one side until the bread is golden brown. Use a spatula to carefully flip the sandwiches over and finish cooking on the second side. Use a cast iron pan to gentle press the sandwiches. Mix all ingredients together and adjust to taste. I love reuben sandwiches too! Now you have me craving one. Thanks for sharing! I am SUCH a sucker for a good Reuben! Looks amazing! I had a class Rueben at Zoom in Park City a few months ago. Yum! Oh my goodness YUM!!! I haven't had one of those in a long time and it looks so good!!! This looks SO scrumptious! I can't remember the last time I had one of these. Thanks for sharing how to DIY at home! Pinning! Agreed, SUCH a classic-- YUMM! Reubens are a favorite in our house... So much flavor!